Harry Bernstein‘s phone will soon be buzzing like crazy. 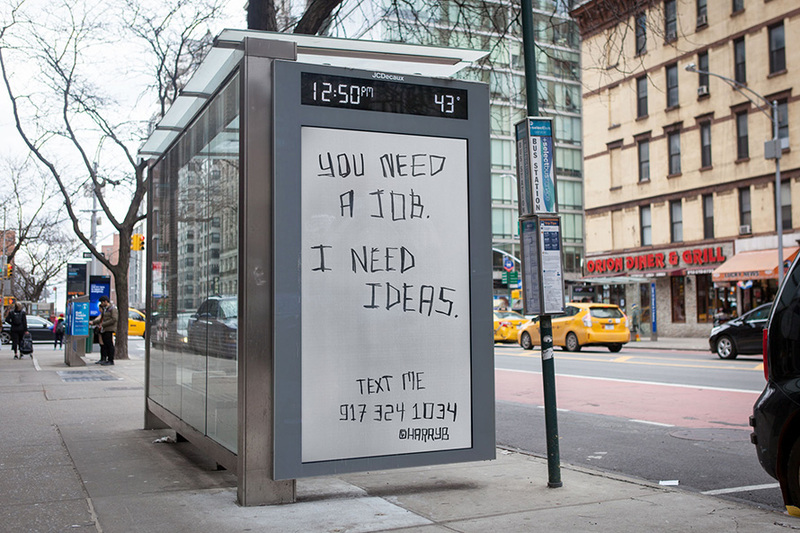 That’s because the Havas New York chief creative officer is brazenly pasting the number on ads in New York City and on 14 college campuses around the country, urging aspiring ad pros to text him directly for a shot at an agency internship this summer. The unconventional approach is perhaps not surprising from Bernstein, aka Harry Beee, the colorful founder of social media and digital shop The 88 (which Havas acquired last year and put under the banner of its cultural network the Annex). Interested parties can text Harry at 917-324-1034, but he’s not looking for simple links to your portfolio. He wants your best ideas for how to change the world for the better—a bit of a loftier goal than agencies usually have for their summer interns. You don’t have to be a creative type to apply—you can be from account, strategy, PR, finance, talent, or really any discipline. From today through April 11, Bernstein will reply to texts and eventually pick 40 interns who seem to have the most potential. They will get to come to NYC, intern at Havas for 10 weeks starting in June, and perhaps even make their world-changing idea a reality—thanks to the weight and resources of a big-city ad agency. 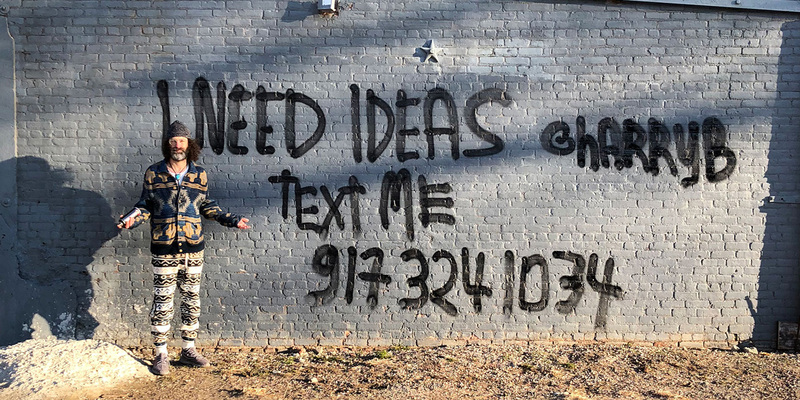 We spoke with Bernstein by phone (texting back and forth seemed inefficient) to find out why he wanted to connect with prospects this way, why he thinks a text message is the perfect test for a budding communications professional today, and how the campaign might attract the “happy, hungry, curious” workers he’s looking for. Adweek: First things first. Is your data plan up to date? Harry Bernstein: (laughs) Yes, my data plan is up to date. I’m ready for unlimited text messages. It’s going to be interesting. So, this is your real phone number. Yes, it’s my work number. So I guess you won’t mind getting inundated on your work line. My real philosophy, from coming from Annex  over to Havas, has been that we are a people-first industry. To do great work, it’s really about people. We have a thing called Breaking Bread, where me and Laura [Maness, CEO of Havas New York] have dinner with 10 people once every two weeks already. So, being close to people is everything. Beyond doing creative, I spend my time with two groups of people—the people I work with, and my clients. That’s how I divide my time. I have a work breakfast every morning. I’ll either be meeting with people I work with, or new talent, or a client. This is the style that I’ve adapted to, even before this campaign launched. It gives me a lot of anxiety. I don’t like that many people to have my phone number, or I won’t get anything done. But I suppose it’s useful for you to be out there and be reachable like this. The Annex was built on social. We were very involved with Instagram, and a Snapchat partner. I do believe in the power of the evolution of how we communicate. For me, I do think when someone sends a text, it’s different than DM-ing someone. The context is different, and I hope that comes through. If you take the ecosystem of the way we communicate—whether it’s through Facebook Messenger, or Instagram DM, or Snapchat even—besides writing a personal note by hand or making a phone call, I do think a text message is the most personal way to communicate. I’m hoping it breaks down that wall a little bit and makes the connection a little more sincere. It’s also about communicating with college kids in their own environment. Totally. I obviously have a C-suite role, but to build a level playing field—I carry this in my daily life. My door is always open. Now, my phone will always be open. You get a formal CV. You get a portfolio, which is obviously super important in being able to express your work. You build your Squarespace. But can you get me—and this is the world we live in—can you get me in a personal, engaging way and express what you’re about in a text message? That’s the brief. That whole line about “It’s not business, it’s personal” doesn’t apply. Business is personal, and I look for people with character. That’s what made this business interesting to me—the classic characters that drove this business. I’m looking for those people who can communicate naturally this way, tell me what they’re about and what they want to do, through a text. I have a feeling you’re going to get a lot of emojis. (laughs) I know. There has been this debate about what emojis are doing for the way people communicate. I think emojis have value in getting straight to the point, and making communication a little more fluid. It sounds like you want ideas on how to change the world for the better. Why? My three pillars that I lean into are “hungry, happy, curious.” I look for driven people—who’s going to take the initiative? Second is “happy.” I don’t believe that work makes you happy. I think you have to come to work happy, and you bring that to what you do. And what happiness comes down to is, really, purpose. That’s where true happiness comes from. And if your talents lie in advertising, communications, strategy, you have to find the purpose that will bring you happiness with it. I want people coming with that purpose. And then, my final thing is curiosity—driven people who are not just taking the world at face value. The core of “hungry, happy, curious” is happiness, and that comes through purpose. And I really want to have that character in these people that I’m looking for. 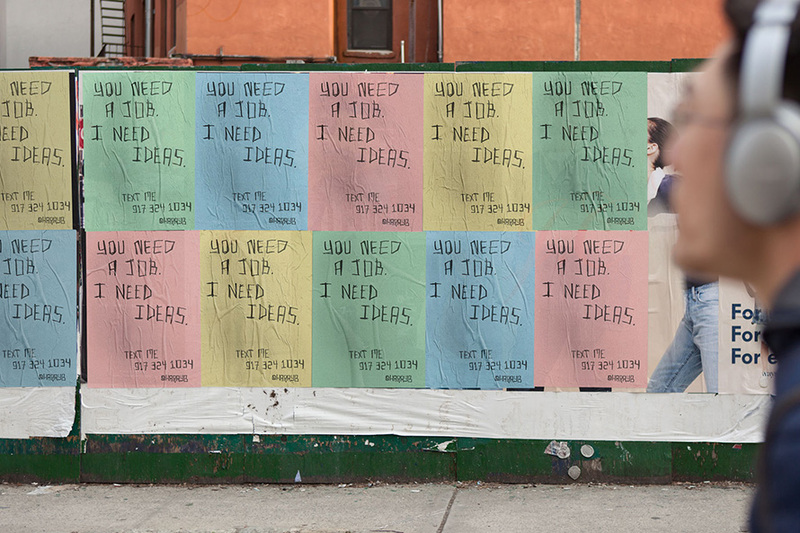 Are you looking for ideas in the context of brand advertising, or can they be about anything? The thing I love about Havas, and what drove this partnership in the first place, is that we can do anything, from a website to a Super Bowl ad. We have the spectrum at our fingertips of people who are experts across all the different crafts of advertising. So, first of all, what do you want to change? And then, do you have ideas for formats and ways to do that? This internship is about either leveraging talents that you have, to accelerate them and make them better, or—and I’ve used the word apprenticeship more than internship, because I do believe advertising is a craft—it’s an apprenticeship to bring something to life that you couldn’t do on your own but you had the beginnings of. It can be anywhere from an analog thing like a card, to an app, to a website, to a piece of content. It will build into the person’s skill set, and also what they want to glean from this relationship with Havas. It’s pretty clear what the interns get out of this arrangement. What does Havas get? It’s meeting new talent. My job is to create an inspiring working environment for the people who work with me, and then find new great talent for my clients. Obviously my clients and I have connected in some areas, but am I able to get the best talent for them? What better way to do that than to find that person that’s hungry, who’s going to take this leap and text me, share something that I think will speak to their character, what they believe in, and then see how we can work together and build chemistry? I was an intern in college for two years. I was in publishing at the time. I worked at Little, Brown. I believe in the power of internships. I have, in my career, hired a lot of interns to work for me. I’ve seen a lot of success in grooming and growing talent.